Telesis Systems Inc. has now been approved to offer structured Small Unmanned Aerial Systems (sUAS) Drone Training Courses under its Federal General Services Administration (GSA) Schedule Contract Vehicle (GS-35F-0238N). Federal, State, and Local government agencies and other authorized organizations can now take advantage of this streamline purchasing process; saving time, money and resources. In addition, GSA Schedule buyers can also take advantage of the discounted pricing offered by GSA. 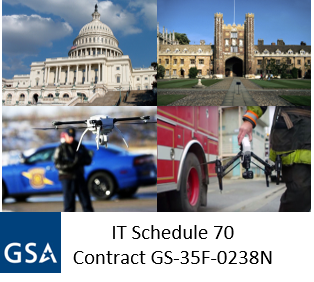 Eligible State, County, City and Local Government organizations such Public Safety, Emergency Management, Law Enforcement, Fire, EMS and Natural Resources Departments can purchase (sUAS) Drone Training courses through our GSA Schedule Contract. Eligible Colleges and Universities can also purchase our (sUAS) Drone training Courses through this GSA contract vehicle. A “GSA Order” containing a list of eligible buying organizations can be found at the following link: (Eligible Agencies and Organizations).